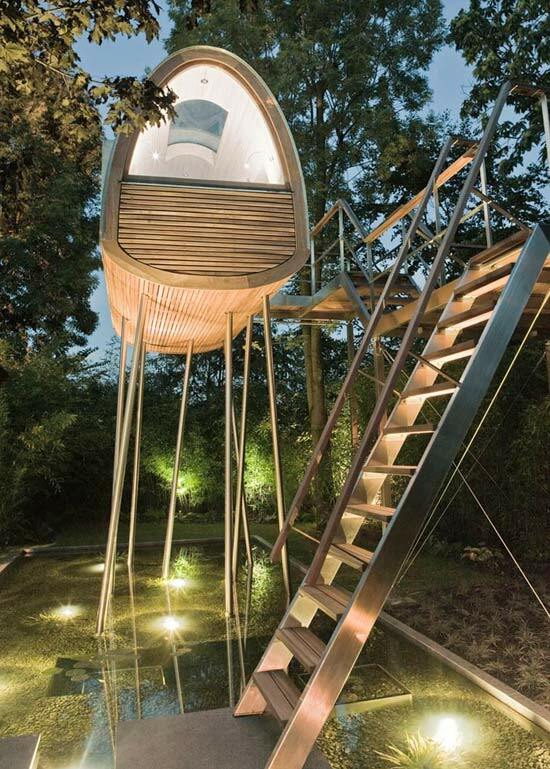 Tree houses are fantastic! I never had one as a child although I did spend heaps of time climbing and sitting in trees. When we purchased our house years ago it came with the added bonus of a tree house but sadly my young man wasn't interested in it for long. 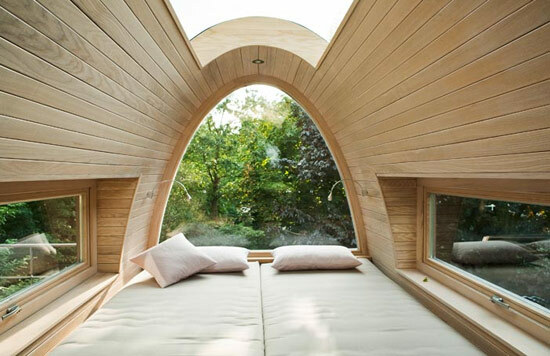 All of those tree house accommodation pictures look wonderful. My husband and I stayed in one in a rainforest in Thailand years ago which was very basic yet so perfect. We had a flowing river below us and gibbons keeping us awake at night. It wouldn't have cost more than $10-15 a night! I am going to have to visit Thailand just for that hotel! How amazing, and what an amazing price! A tree house and a cave! What a trip - clearly I am going to have to try harder in finding those sorts of places to stay. Ahhh I want all of those places right in my backyard! They are amazing! My cousins had the coolest tree house growing up...it's still there but they only use it for storage now :( That's how you know it was huge...it can be used for storage! I can't even think how many hours I spent up trees as a child. So much better than nintendo or computer games, that is for sure! so fun! 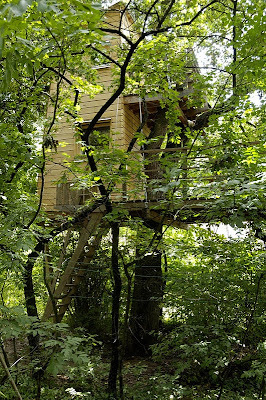 I did love to climb trees and for our honeymoon we stayed in a "treehouse"- it was so fun! I was totally a tree climbing kid. We didn't have a tree house as such, but there was a grove of birch trees that we made a little house in the middle of, it was great. 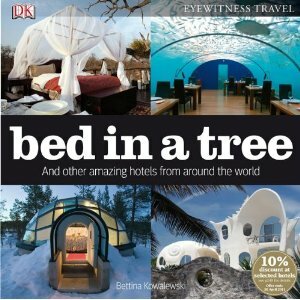 I can't remember the last time I climbed a tree, but I would adore to stay in one of those tree hotels. So funny for someone who is afraid of heights but it is ok if I'm in a tree! Me too :) So much so that I had a tendency to get stuck up trees as a child - I was completely fearless on the way up, but then couldn't always work out how to navigate back down! There was a forest past the pasture behind our house when I was growing up in Maine. I was never officially a tomboy but every day we'd find a reason to get to the forest and make cabins, tree houses and mischief. I loved it. Those were the days when mothers put kids out in the morning with a picnic to take to the woods and we didn't come back til we were thirsty again. 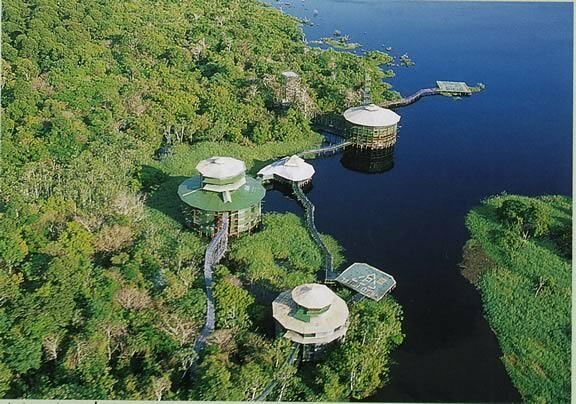 I've never been to a treehouse hotel but it looks amazing. How I would love to be put out in the morning with a picnic to take to the woods, even now. It sounds like a wonderful childhood. Oh cool! 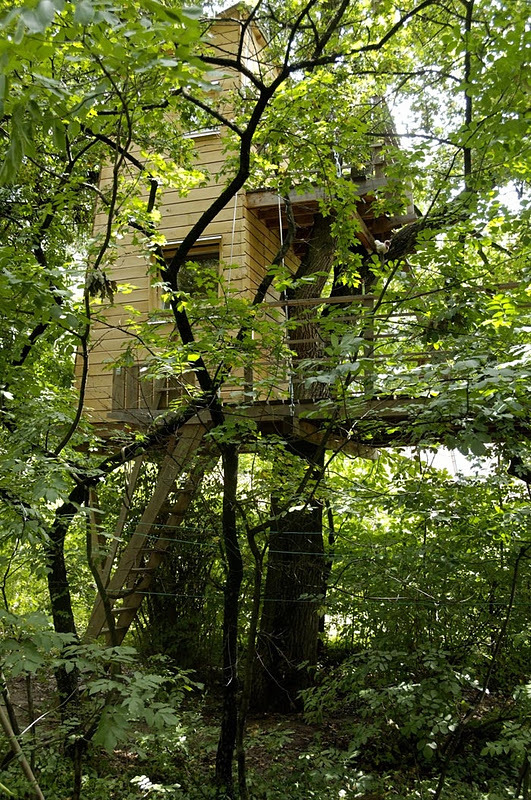 I wanted a tree house experience so much I put it on my "30 before 30" to-do list. We stayed in a tree house on our honeymoon in the tablelands. It was pretty cool! There are others nearby, I think in the hills behind Mackay, that I wouldn't mind staying in. But these ones look pretty flash! Yes! At Eungella you can go to Platypus Bush Camp, which are like tents in trees, and in the Atherton Tablelands there are treehouses galore - we stayed at Mt Quincan, which had spa baths looking out over the tops of the trees into an extinct volcanic crater, with all kinds of wildlife playing right out the window - including tree kangaroos, if you're lucky (we weren't). Oh how fantastic - thanks Theresa :) Mr B may not know it yet but this is now in my mind for 2013! How cool are these houses!! I have never had a treehouse before, but have always wanted one. My cousins and I used to put these chairs together and drape a bunch of blankets over them and call them our "tents".. we had such a blast! So amazing!! Growing up I was always building "forts" with my brothers in the woods behind our house. I would LOVE to stay in one of these....I'm seeing an addition to my bucket list! They're definitely on mine now too!